it seemed that the NYCTaper 2012 Northside Festival showcase provided an ideal time for bands to try out different sets and arrangements and be a bit more adventurous with their setlists and performance. White Hills, who I had seen more recently than the other bands who played, gave a set that focused on some of their classic, most exploration-friendly numbers, and duly impressed both first-timers and White Hills vets. We knew we were in for something special when “Song of Everything” from the band’s latest LP, Frying on this Rock, was the second song in the set, flowing straight into “You Dream You See” from that same record. But the track that followed, “Let the Right One In” from the band’s 2010 record, White Hills, was what sealed it for me as my favorite White Hills set yet, with its slow build to its cosmic climax. The closer, “Polvere de Stelle”, also from White Hills, was equally a highlight. The Hills are the type of band that always keeps things interesting, and even in this festival-length format, they were able to give us that and more. 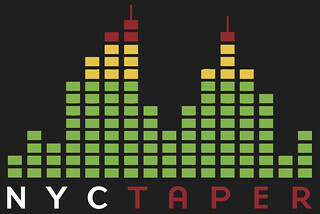 nyctaper and I recorded this set with Sennheiser MKH-8040 mics in our usual spot in the venue, plus Audio Technica 3031 mics at the stage lip and a soundboard feed. The resulting wall of sound is an outstanding representation of the night. Enjoy! Special thanks to Thrill Jockey Records and White Hills for playing the show. You can download other sets from the NYCTaper Showcase as well, including EULA and Rhyton. Thank you very much. I know what I’ll be listening to tonight.